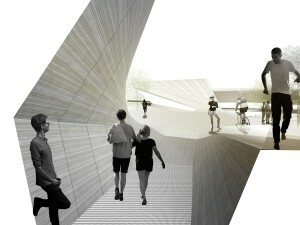 ElastiCity is an adaptable city center and performative landscape in an emerging region of Southern Europe. The project ‘breaks’ the monumental axis to enclose intimate and civic plazas, creating a vibrant destination that gives space back to the city and its residents. The project provides a flexible, adaptive framework for urban improvement, offering a robust series of alternative but equally viable solutions which can accommodate varying levels of investment and a multitude of stakeholders. The project thus provides a ‘generic specificity’ – a nuanced, idiosyncratic, and performative landscape paired with a genetic and generative architectural language – to both orchestrate new behaviors, and allow for unexpected personal occupations, engagements, interpretations, and imaginations to emerge. The ‘S-shape’ circulation acts to slow north/south vehicular traffic through the center and open the site to vibrant pedestrian use, while simultaneously providing more seamless connections to east/west highway corridors. 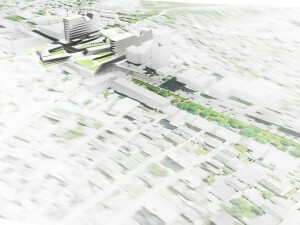 The sculpted topography and built form blocks sound and directs movement, creating two new ‘urban corridors’, one running north/south through the site and over the landscape, and one running east/west access under the raised cultural center and municipal buildings which serve as ‘gateways’ to the surrounding neighborhoods. The site’s many outdoor spaces are conceived as a culmination of a network of neighborhood courtyards and greenspaces, where people gather for cultural activity, transit, and leisure. The site’s parking amenities are completely open to the community after business hours, relieving the pressure on the neighborhood’s back streets, and effectively returning the public space of the alley – now occupied by parking- back to the community. The flexible schedule has the added benefit of enlivening the site with commuters returning from work in the evening. The site is conceived as a ‘stitch’ in the previously disrupted urban fabric, integrating the new buildings with three distinct public plazas. The S-shaped plan creates three main plazas, an ‘urban’ plaza to the southwest, a ‘neighborhood ecological plaza’ to the northeast and a ‘cultural’ plaza to the northwest. The distinct but complementary uses of the three plazas augment each other, with daily and seasonal activities activating the site year-round as a destination. To promote flexibility, transparency, and public engagement in the definition and the use of the building, private and public spaces are ‘braided’ throughout the topographic form, providing unique opportunities for public engagement with political and cultural processes, and leaving an ambiguous and continuously evolving definition of use, articulation, and ownership. 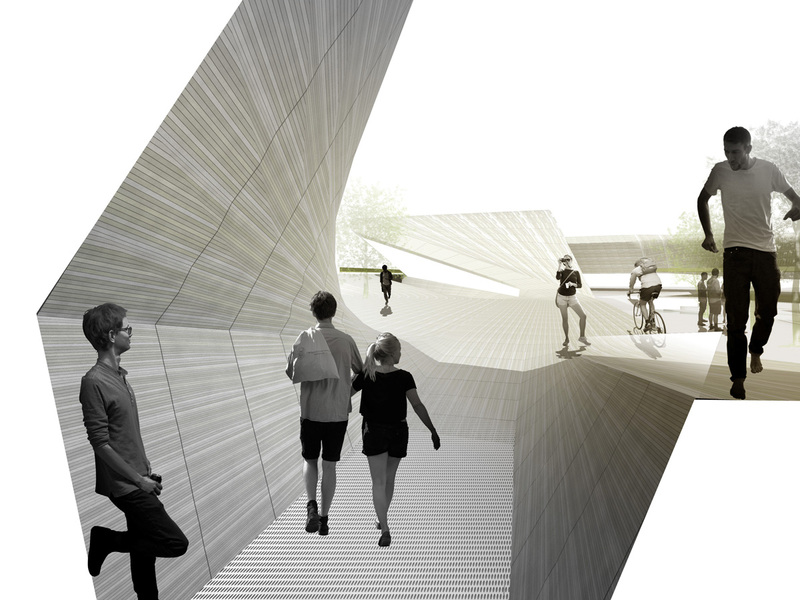 A networked pattern of ramps and terraces are used by office workers and administrators during the day and re-imagined at night as informal auditoria, cafes, performance spaces, gathering places, and viewpoints for visitors to take in vistas of the surrounding landscape. As the buildings’ occupancy rates swell and contract, these flexible zones absorb the changing patterns of use, easily converted for retail, urban parkland, and touristic services. 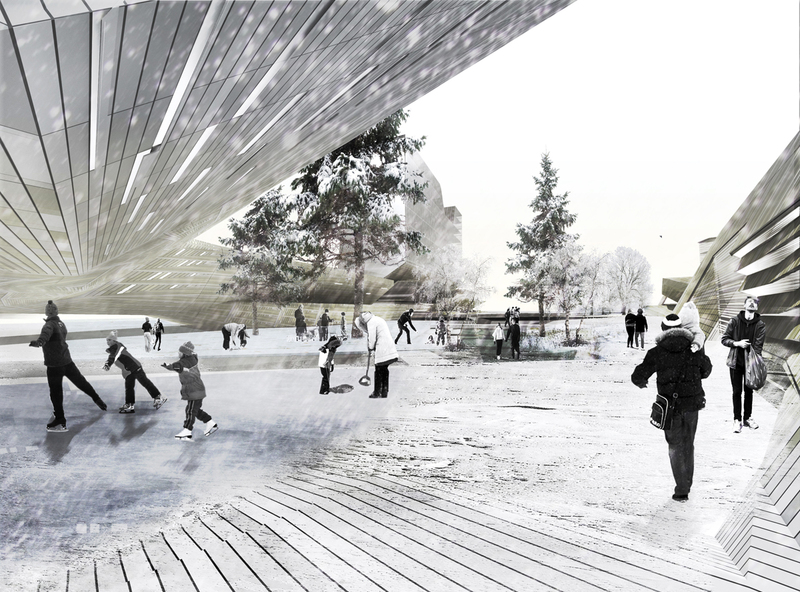 The building mass is ‘eroded’ with planimetric and sectional carving to create continuous urban corridors, public entries to the building at ground level, large ‘anchor spaces’ for community gatherings, woven, flexible semi-public spaces, and private spaces which double as rainwater collection areas. The building skin and plaza are surfaced with patterned ceramics, providing a cool, tactile, and durable surface with a high degree of variety in texture and function, inviting residents to inhabit its many folds which double as seating, overhangs, and tactile interactive water features. The building and landform are thus an extension of the ‘ground’ of Gjilan, reshaped to promote a more productive future. The project develops from the ground up, starting with the alteration of the existing circulation and the delineation of the topography, creating a pedestrian-friendly area staged for later development. The low ‘S-shape’ will immediately transform the space and its relationship to the city whether or not other elements – like the upper levels of the hotel and municipal building get developed as planned, providing a flexible framework without compromising the urban gesture. The project ‘DNA’ is capable of achieving a variety of built forms through the distribution of simple architectural, landscape, and program components. This ‘design infrastructure’ is highly adaptable and flexible to the needs of the city and desires of its many constituents, a ‘software’ for urban development. The sensitive, contextual massing is one optimization the framework allows, lowering the mass of the podium level to match the height of the surrounding neighborhoods, continuing the streetlife of the neighborhoods into the new public spaces at an intimate scale, while raising the height of the hotel and municipal building to frame the site and continue the rhythms of larger development along the monumental axis. The S-shape also works to accommodate changes in program in the planning and ‘fit-out’ of the project. Programs are easily ‘slid’ along the shape to where they best match their spatial (size, proximity) and programmatic (view/access) needs. Over time the occupation of the project might change – as new relationships between public, private, and civic entities are manifest, the ‘mix’ of programs along the length provides opportunities for exchange and changing types of organizational transparencies. 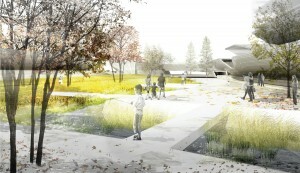 Leveraging the performance of the site as a model for development, the site is re-imagined as a public and regional asset, a center for research and development, and an infrastructural amenity – a new ‘space’ in the cultural and intellectual life of Gjilan, Kosovo, and other emerging regional centers.